Can You Be Ultralight with a Snow Shovel? If you're planning a backpacking trip in snowy conditions, you'll need a snow shovel. And when I saw snowy conditions, I'm not talking about starting an Appalachian Trail thru hike in March. Yah, there might be some snow, but I'm talking about accumulations of snow on the ground. Feet of snow that you'll have to dig through just to set up your tent. Those are the times you need a snow shovel. Yah, snow shovels aren't super light. Obviously in the backpacking world everything has been trimmed down in size and has swapped out as many materials as possible for plastic, aluminum and titanium in order to reduce the weight. Backpacking snow shovels range in weight from 6 ounces up to 2 pounds. Figure out what your use case is first then optimize for weight. Here's a quick comparison chart of the 3 snow shovels we're going to compare with my top choice being the Snow Claw which only weighs 6 ounces. You probably didn't put much thought into buying a snow shovel for your house. But buying one for backpacking is totally different. Backpacking snow shovels are optimized to be compact and lightweight and there are some radical differences between the 3 snow shovels shown in the table above. 2 of the snow shovels shown above look like normal snow shovels with a handle and a blade that moves the snow. But the SnowClaw is very different. It's basically a large paddle that you hold on to and dig through the snow like a platypus...if a platypus lived in the snow. Obviously this was done to make the "snow shovel" as small and as lightweight as possible, but it also comes with some drawbacks. For one, you'll be on your hands and knees doing the digging of the snow and you won't have as much leverage due to the lack of a handle. This means wet snow can be challenging. You'll also only really want to use the SnowClaw for digging out a tent site. It's pretty exhausting to use for long periods of time so you wouldn't want to use it to dig anyone out of an avalanche or for clearing out your driveway after a storm. The other 2 snow shovels look more like traditional shovels you'd find at your house. The main difference is that they are collapsible and break down into smaller parts so you can fit them in your backpack more easily. Obviously weight is a big deal with any backpacking gear. You'll be carrying your snow shovel with you the entire time you're hiking so don't get anything too heavy. That's why I prefer the SnowClaw since it only weighs 6 ounces which is about 1/3 what the other snow shovels weigh. Normally I'd fault plastic for being weak and praise aluminum for being so strong, but SnowClaw did a great job with the HDPE plastic to make sure their snow shovels are strong and reliable. If you've had to shovel snow out of your driveway before then you know that it puts a lot of stress on your back. Most of the weight gets transferred through the shovel and your arms into your back and gives you a pretty good workout. The longer the snow shovel handle, the more leverage you can get which means less force on your back. Since all of these snow shovels are trying to be as small as possible, the length of the handle is the first thing to go. These shovels are very compact and the main complaints people have are that the handles are too short. This means you'll be hunched over putting a lot of stress on your back when you're using these snow shovels. Not fun. The SnowClaw "snow shovel" is the most lightweight and inexpensive snow shovel on the market. It's a little weird to use and you wouldn't want to clear your driveway out with it but it's perfect for clearing out snow to set up camp. The SnowClaw is perfect for ultralight backpackers who want to reduce their weight and save space in their pack. "Product prices and availability are accurate as of the date/time indicated and are subject to change. Any price and availability information displayed on Gearsignal.com at the time of purchase will apply to the purchase of this product." The SnowClaw is the clear winner between all of the backpacking shovels on the market. It only weighs 6 ounces and costs less than half of some of it's competitors. The design is a little weird but it works. Clearing out snow for your campsite is a breeze and there's no setup/assembly required like with the other collapsible shovels. KYLIN doesn't specialize in backpacking gear but somehow they landed on a winner with their snow shovel. It's made of aluminum so it's a good competitor to the traditional backpacking snow shovel competitors. The KYLIN snow shovel collapses down to 14" which is a little smaller than the Black Diamond and it costs half as much. There's nothing wrong with the Black Diamond snow shovel if you were looking at where the market was in the past. It's a perfectly capable snow shovel and it collapses down to a small-ish size. But it's been left in the dust by the SnowClaw. KYLIN swooped in and created a better design (it collapses down smaller) and significantly undercut Black Diamond on price. There's nothing wrong with this snow shovel but other options are better which leaves this as my last choice. If you're planning to do a lot of winter backpacking, a snow shovel is a must. 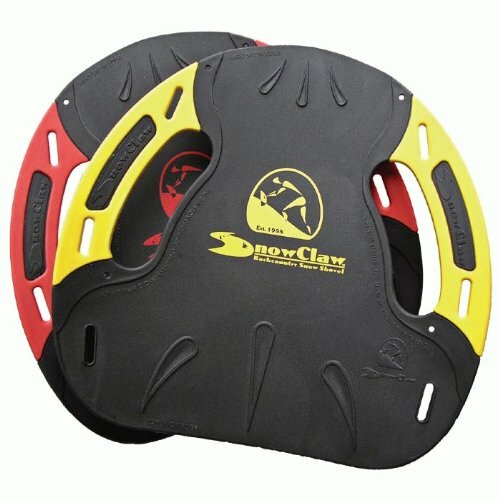 Since SnowClaw came on the market it's been the top pick in the backpacking community. The SnowClaw is the perfect combination of low price and small form factor that make it perfect for backpacking and easily my #1 choice. Made from high impact copolymer for a flexible and lightweight design suited for optimal handling and transportation. 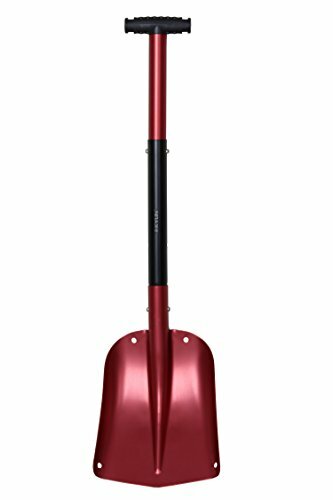 2 sided handles make this shovel an easily manageable tool with the use of both hands pulling in the same direction. Multi-functional design of the SnowClaw makes it a great tool to be used as a snow anchor, plate, sled or emergency splint. Incredibly tough yet very flexible, this shovel transforms into a rigid tool by slightly squeezing the handles together into a "U" shape. High-impact copolymer material remains pliable and crack resistant up to -20°F, making this the perfect winter sport and camping instrument.